i often turn to risotto if i’m tired or stressed. the acts of chopping and stirring are hugely soothing and the need to open a bottle of wine as part of the recipe also adds to the experience! 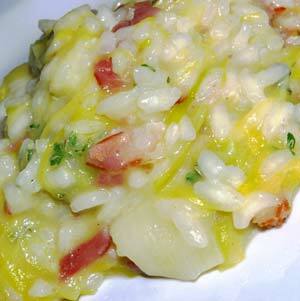 leek and pancetta risotto is a combination i stopped making after one attempt which was very mediocre. however, an abundance of leeks in the fridge, which were starting to look very tired and in need of using up, made me try again. this time it was really delicious – using lots of leek is, i think, the key, this recipe used four leeks for a two person risotto – and it’s going back on the menu! melt the butter in a large pan and add the leeks. cook over a low heat until the leeks have softened – this will take c15 minutes and you may want to cover the pan with a lid and stir occasionally. add the pancetta, turn the heat up and cook until the pancetta is ready. add the rice, stir and add the white wine. keep stirring and when the wine has been absorbed add the stock, a ladle at a time. when all the stock has been absorbed taste the rice to see if it is cooked. if not, add more stock (or just use hot water) until it is ready. when the rice is ready, stir in the parmesan and oregano. cover and leave for a few minutes before serving.